Robert Trevi­ño will lead the California Symphony for three concerts on May 3 at the Bankhead Theatre in Livermore and on May 4-5 at the Lesher Center for the Arts in Walnut Creek. This program features Berlioz’s powerful Symphonie fantastique, Beethoven’s Violin Concerto performed by the violin virtuoso Caroline Goulding, and the world premiere of Sparr’s Violet Bond: Concert-Overture. This debut work pays homage to the memory of Sparr’s great-grandmother, Violet Bond. Nanny, as her family called her, was a staid music lover and would draw family members around her piano as she led the group in hymns. Sparr also remembers watching He-Haw with Nanny at her home and attempting to imitate Roy Clark and Buck Owens guitar playing with a broom. Perhaps she just wanted her broom back, but for Sparr’s fourth birthday Violet gave him a ukulele, thereby inspiring his tremendous career as an electric guitarist and composer. This work integrates the inherent improvisational aspect of the electric guitar with musical play between guitar and orchestra. Using a “loop effect,” Sparr assigns an orchestral role to the electric guitar while playing over the “loop” and highlighting the solo melody. An accomplished composer and electric guitarist, D.J. Sparr has caught the attention of critics with his eclectic style. San Jose Mercury News described his music as “pop-Romantic…iridescent and wondrous” and The New York Times said it “suits the boundary erasing spirit of today’s new-music world.” The Los Angeles Times praises him as “an excellent soloist” and the Santa Cruz Sentinel says that he “wowed an enthusiastic audience…Sparr’s guitar sang in a near-human voice.” Sparr currently holds the Young American Composer-in-Residence position with the California Symphony, an acclaimed program that has seen the likes of Mason Bates and Pulitzer prize winner Kevin Puts. During this tenure, Sparr’s works have been conducted by Nicholas McGegan and Donato Cabrera, among others. Sparr has also had recent world premieres performed by the Dayton Philharmonic, Richmond Symphony, Eighth Blackbird, and the Hexnut Ensemble. This Summer, Centaur Records is releasing a CD of Sparr’s chamber music, entitled 21207 which was supported by a grant from New Music USA’s CAP Recording Program and in June, the Washington National Opera will premiere Sparr’s “Approaching Ali,” commissioned on behalf of their American Opera Initiative, based on the acclaimed novel “The Tao of Muhammad Ali” by Davis Miller. Sparr was awarded the $10,000 grand prize in the orchestra category of the BMG/Williams College National Young Composers Competition and has received awards and recognition from BMI, the American Music Center, Eastman School of Music, George Washington University, the League of Composers/ISCM, and the Pittsburgh New Music Ensemble. A fast rising star, D.J. Sparr’s musical vision is bound to catapult him to the realm of indispensable American composers. This season, the California Symphony is trying on seven different guest conductors. Ninety candidates applied for the maestro’s job, says symphony Executive Director Walter Collins. After an extensive interview process, seven finalists were selected to design a concert, work with musicians and perform for symphony audiences. Robert Treviño is the final guest conductor during this 2012-2013 season, aptly entitled “The Search is On.” Other music director candidates performing this past season have been Robert Moody, David Commanday, Michael Butterman, Sean Newhouse, Alastair Willis and Donato Cabrera. 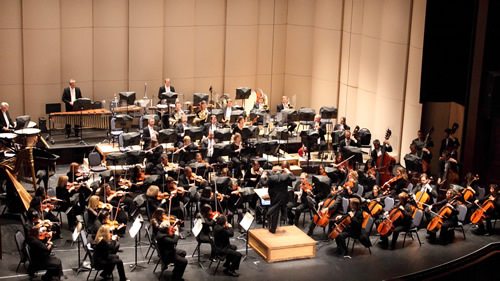 Audiences, including those at the upcoming concerts in Livermore and Walnut Creek, are invited to participate in choosing the symphony’s next permanent music director by filling out a survey on the Symphony’s website. The symphony’s board of directors will make the final decision later this spring.